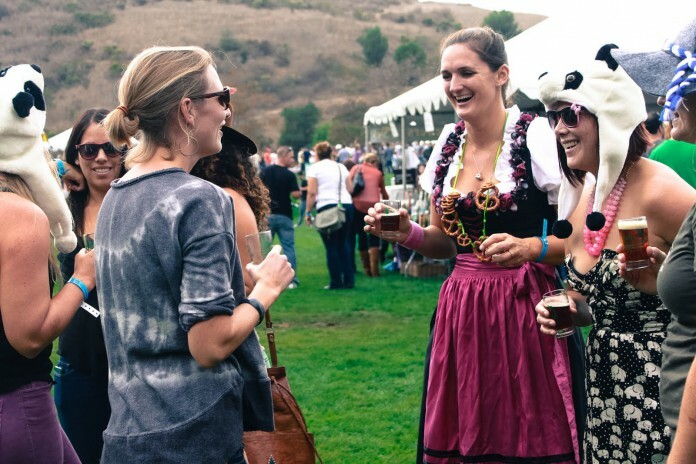 It is not often that one sees lederhosen and pretzel necklaces in Santa Barbara, but these costumes contributed to the merriment at the fifth annual Santa Barbara Beer Festival on Saturday. Not even an overcast day could stop over 2,000 beer lovers from flocking to Elings Park for the festival from 12 to 4 p.m. Proceeds from the event went to Elings Park and the Santa Barbara Rugby Association while over 27 local and west coast breweries showcased their brews. Bonnie Keinath, a volunteer at the festival and a Santa Barbara native, commented that this was the first time the festival officially sold out. Spirits were high and beer foam was already flowing by noon as live artists performed bluesy jazz and rock music. Apart from the lederhosen, attendees dressed casually as they mingled in large groups. Charlie Essers from Heretic Brewing Company in Pittsburg, California attended the Santa Barbara Beer Festival for the first time. With fun names of the brews like “Evil Cousin” and “Evil Twin,” Essers said that he hoped to make people sampling the beers into fans, or “heretics,” of the brewing company. Essers described Heretic beers as “not to style,” meaning that the beers break from classical brewing traditions to produce beers like nothing else on the market. “The irony of that is that the owner wrote the book on brewing classic styles,” said Essers. Since the company has only been established for two years, Essers said that many people had not heard of Heretic Brewing Company before and the festival was a great way to promote the brand. Morgan Ross-Smith, Northeastern regional sales manager for Anchor Brewing Company in San Francisco, agreed that the festival was a great platform to promote their brews and have people sample them. Ross-Smith said that Anchor Brewing Company is considered the oldest craft beer in America. The company showcased their “Anchor Steam Beer,” named after the steam that floated over the factory from the fermenting process on cool San Francisco nights. Ross-Smith described the brewing company’s beers as “Californian common, amber lager.” According to the Anchor Brewing Company website, the beers date back to traditions from the California Gold Rush and utilize water, barley and hops from California. Woodstock’s Pizza, Judge’s Sausages and Cabot Cheese provided food for the guests to munch on between their gulps of beer. Each attendee received a small beer glass to sample the various brews. The event was limited to patrons 21 years old and up, and encouraged attendees to drink and drive responsibility. Bill’s Bus transported guests from downtown Santa Barbara to Elings Park and back for free. Additionally, volunteers posted an information board with the phone numbers of local taxi companies to transport attendees home. Designated drivers purchased discounted tickets of $12 and received water and a free meal from Judge’s Sausages. The regular price ticket was $45. Bonnie Keinath has high hopes for the festival in future years.